This is an authentic Tom Petty signed tele-caster guitar. 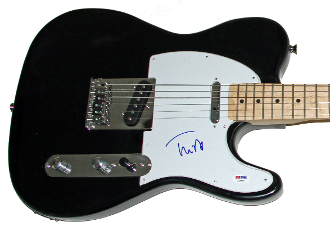 Tom Petty signed this particular guitar in Los Angeles in April 2008. The signature is solid and was signed by Tom Petty, using a blue permanent felt tip. This guitar signed by Tom Petty is guaranteed authentic and comes two forms of authenticity. My (LOA) Letter of Authenticity that carries a lifetime guarantee for this item and states the date and place Tom Petty signed. Also, to further assure the authenticity of this amazing guitar, this item has been authenticated by PSA DNA, a reputable third party authentication service. The PSA DNA certification number is Z39992 and can be verified on their website. If you have any questions feel free to email me. Thanks for visiting and be sure to check out my other authentic treasures for bid.